PEN America Best Debut Short Stories 2018 is a primarily strong effort where the voices represent a tempting sample of some potentially great literary careers just beginning. The second annual edition of any short story collection will always exist in the shadow if its predecessor. The writing represented in PEN America Best Debut Short Stories 2018 first appeared in such publications as The Rumpus, McSweeney's, Slice, Epoch, and five separate Reviews (New England, Washington Square, Black Warrior, Brooklyn, and Baltimore.) The sources remain relatively constant, but the urgency in the voices of these writers is a little stronger. It isn't that the stories in this sophomore collection are stronger than the freshman batch. That's not the point. The primary theme in these stories is immediacy and identity. Pay attention to who we are, even if the immediate impressions might not be clear, and give us more space at the table than just a small spot at the far corner of the room, away from the food, away from the action. "Can you play the character they are looking for at your Credible Fear interview? ...This is the only time your humanness will be based on your dehumanization… say only what they want to hear." Igarashi notes that the most common quality in characters expected to perform is that this obligation is usually only temporary. In these stories, performance becomes a key part of their lives. "If the stories here reveal how we become the selves we perform, they also reveal the instability of that becoming." It's within this political context that these stories effectively find their voices, and the consequences are unavoidable. These are stories that hide behind corners, stories that make grand statements about identity, and stories that offer a full life and times in a small format. The characters might still be searching for a costume to call their own, but they will have a home in this volume. This series, featuring a dozen winners of The PEN/Robert J. Dau Short Story Prize for emerging writers (each of whom wins a cash prize of $2k), seems to have a spirit of Hemingway in its mission statement. Robert J. Dau was born and raised in Petoskey, a Northern Michigan city known to be the location where Hemingway developed his early commitment to a writer's life. Not many of the stories here seem to have Hemingway in their DNA, but that's not the point. It's the strength of character that makes them thrive in a modern political world that can sometimes be too cruel and immediate. One of the better non-political stories, Ernie Wang's "Stay Brave, My Hercules"m features Jeremy, a young man in costume at Disney's Magic Kingdom. His partner Jay, (30 years his senior) is dying of cancer. Jeremy finds purpose giving direction to Cody, a Make-A-Wish kid who allows Jeremy to stray from his company script and offer solace for a life quickly drifting away. Lauren Friedlander's "Bellevonia Beautee" is another story about performance where women may be in trouble, but they are strong and focused and they won't go down without a fight. Why are they singing and dancing for this man? What will happen to them? Both these stories are fully-formed slices of bigger pictures these writers could effectively expand in the future. In Maud Streep's "The Crazies", the heroine and her friend are corset-wearing prostitutes in Montana. Their friend Jake plays a cowboy. It could be a slight story (young people performing old-time Western characters for curious tourists) but Streep offers a twist that will stay with the reader. Something bad happens in the forest. A marriage begins and ends. Another one starts, but guilt lingers. "She could always watch him online, drawing her face close to the pixels where his fingers touched the strings; she could pause the video as the camera swept past him to the lead singer. She would touch the screen… her whole body warmed at the image of him." "…strong hands; weak hands; hands with thick, knotted blue veins; rough, calloused…hands with wedding rings and hands missing fingers. At the hospital you were guided to rely on God's grace." What works best in this story is McCutchen's insistence on the natural pathos of this premise rather than horrific cheap thrills. How do we assume a new character as a formerly dead person? How does this former chaplain come to terms with these new beings resurfacing? More strangeness surfaces in Alex Terrell's "Black Dog", where a young woman named Io watches "Phantoms of herself" walking back and forth "…in the scene of the rooftop bacchanalia…" Is this a drug-induced hallucination, or is it something more unexplainable? It's a frightening mix of David Lynch and gothic horror as this young woman has trysts with these phantoms. She wakes in the woods. She is followed by something that can't be named. Again, the horrifying mood created at the start of this story is nicely sustained through to the end. "In the morning, I see the wood I have worn away with my teeth… My jaw aches, but I don't have splinters in my tongue or cheeks. The damage done I have swallowed." "For instance, there is a future available to you, even now, that involves you laying down your life for the greater good, sacrificing yourself at a crucial moment…"
Mood, tone, and voice are strong in this collection, and the final effect is indicative of the strength in the more effective stories. The remaining stories: Celeste Mohammed's "Six Months", Cristina Fries's "New Year's In La Calera", and Elinam Agbo's "1983", might suffer under the shadow of the stronger stories. They're good, but it's hard to draw a through line between them and some of the other characters and themes in the remaining stories. 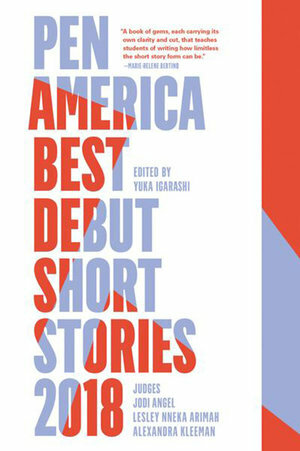 The PEN America Best Debut Short Stories collection is a strong addition to the annual anthologies, and at less than 200 pages it makes for a manageable and efficient reading experience. In the future, the judges might want to consider developing a constant theme each year. These characters are working to create personas as a means of survival, but the more politicized stories would be better served in a separate volume. As is, this collection is a primarily strong effort where the voices represent a tempting sample of some potentially great literary careers just beginning.